To work with microscopic components, you will need a microscope to see. Physical examination is the first place to start with any repair job, as that will quickly tell you the technician what likely is or isn’t the problem with little thinking on your part. A good microscope generally should cost around $400-800 new. 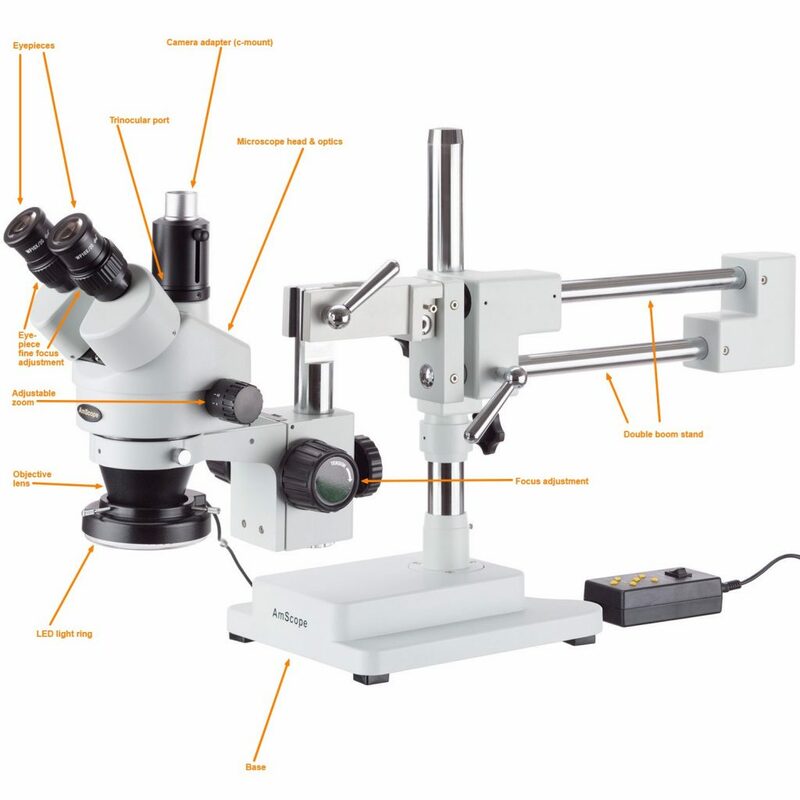 We highly recommend the Amscope SM-4TZ-144A ($529; amazon.com) for a first microscope. This microscope has almost all the key features needed to easily see and work with microscopic components on iPhone and other smartphone motherboards, while also is extremely affordable and will suit the needs of most repair shops for the foreseeable future. The Amscope comes with a heavy double boom stand, which we prefer over articulating and single boom stands for a few reasons. Firstly, many beginners tend to opt for articulating stands because they believe that it allows them to have infinite flexibility. 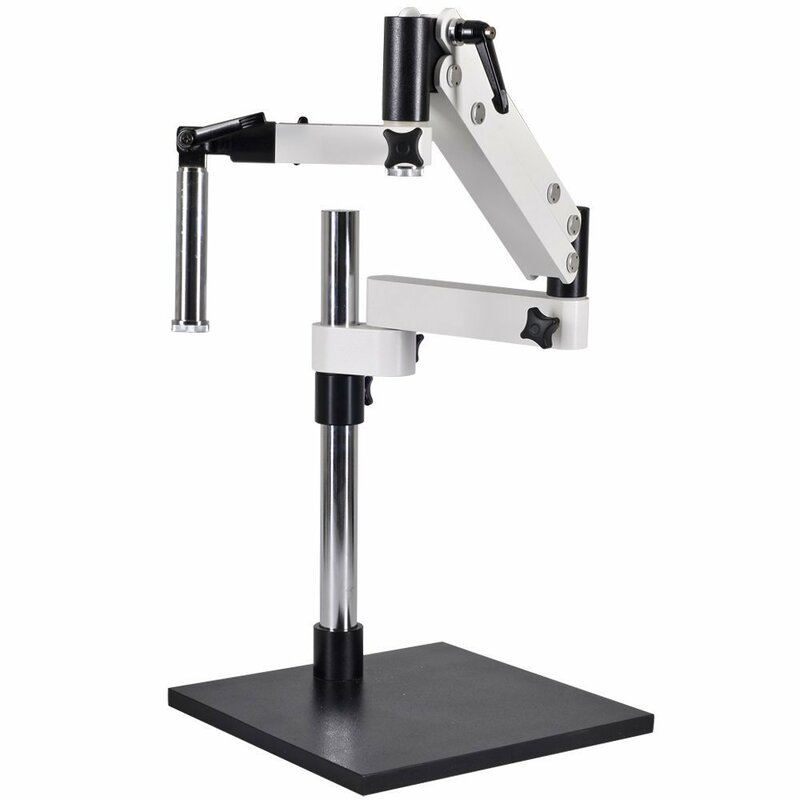 However, we have found that most articulating stands fail to suit our needs in a few respects – articulating stands are notoriously unstable and suspect to vibrations from surrounding equipment like hot air stations or even other people walking by, making it impossible to see clearly through the microscope. In addition, articulating stands end up being less flexible than boom stands because they are hard to keep in one position when working – they tend to drift up and down and side to side so it is impossible to position the microscope exactly where we want it for that particular motherboard that is being worked on. An articulating microscope stand like this tends to transmit vibrations and become very unstable during usage. Single boom stands are generally cheaper than double boom stands, but also have their disadvantages. Because there is only one cylindrical arm connecting the microscope head to the base, if that arm does not have a locking pall then it is allowed to rotate around its axis, and likewise the head of the microscope will rotate as well. This becomes annoying because a lot of the time we would quickly like to be able to move the head of the microscope in and out of the base to inspect, but with a single boom it must be locked and unlocked each time we move it in or out. Double boom stands allow us to leave the arm unlocked without the head rotating so that we can quickly move it around when needed. The single boom allows the microscope head to rotate around its axis on its own, which quickly becomes an annoyance. With the Amscope we also find its variable zoom feature valuable. Lower end microscopes have a fixed zoom, which just isn’t practical for working with a variety of different devices. A variable zoom of around 0.5x to 4x or 5x allows us to be able to choose our field of view and magnification for what we are working on, and be able to zoom in to inspect joints and solder balls closely when necessary. 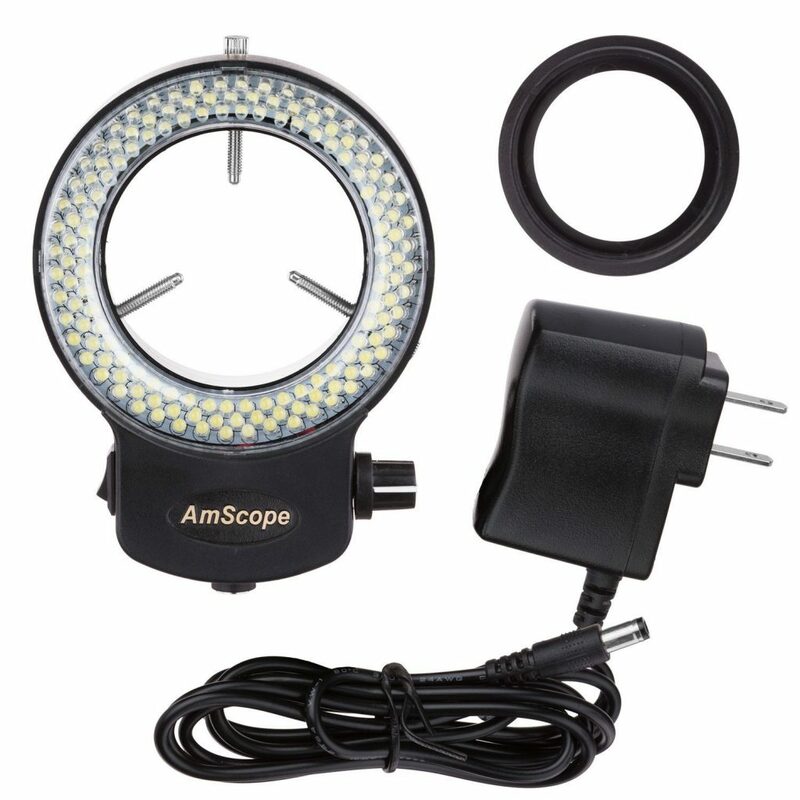 With the Amscope, it comes with 10x eyepieces and a 0.45x-4.5x objective lens. This gives us a total magnification power of 4.5x-45x. 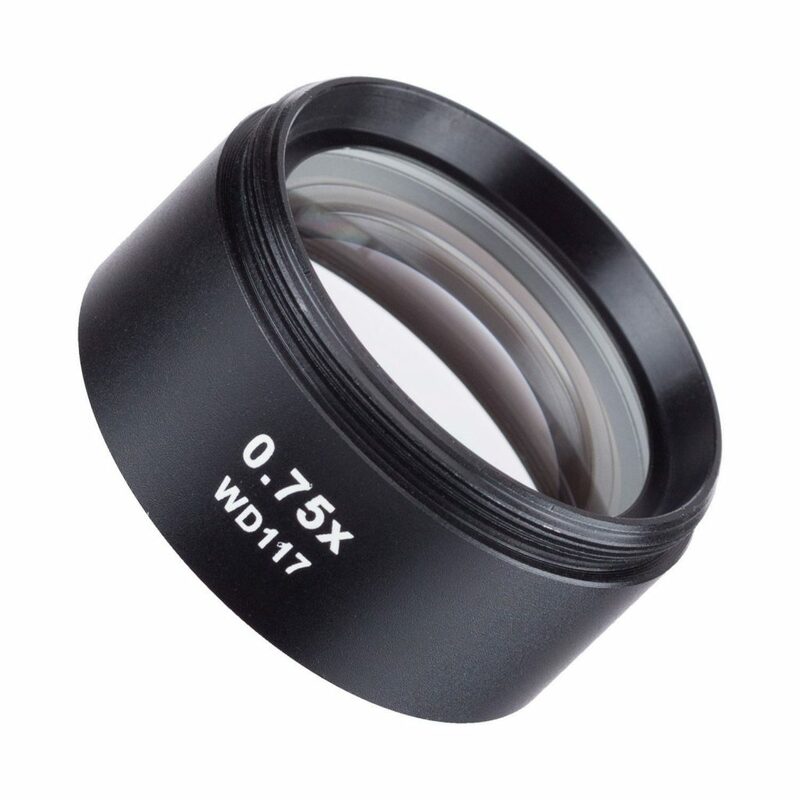 The eyepieces also should come with rubber eyecups that some people find helpful to rest their eyes on. Also make sure to adjust the eyepiece width so that you can see through both eyepieces at the same time without one going black, then fine tune the focus on each individual eyepiece by closing one eye and turning the focus knob on the eyepiece until the picture is clear. 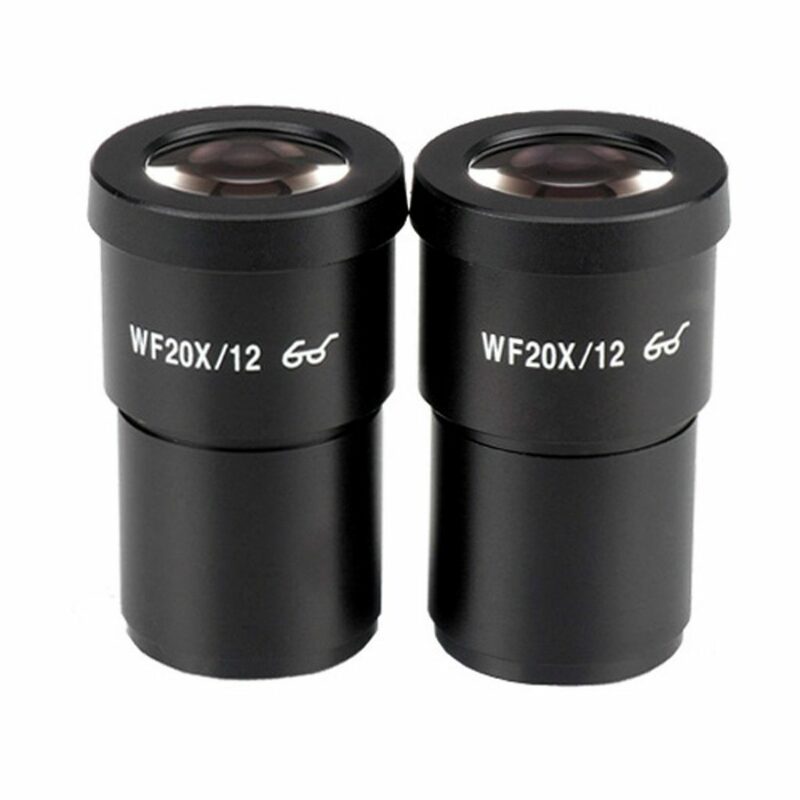 A good microscope can swap the eyepieces for higher or lower magnification ones like these 20x lenses ($44; amazon.com). Working distance must also be taken into consideration when choosing a microscope, as it is extremely important to be comfortable when working under the microscope for prolonged periods of time. Working distance is generally described as the distance between the workpiece and the objective lens of the microscope when the object being examined is in focus. For most microscopes including the Amscope, this is normally around 4” out of the box. However, we find that this is way too little to be comfortable, so we will attach a barlow lens to the head of the microscope in order to increase the working distance to 6”. Some barlow lenses will even increase the working distance to 8” or more, which can be useful for working with motherboards that have a larger height. What is a barlow lens? A barlow lens is a lens that goes over the objective lens in of the microscope head. Typically they will screw into the head of the microscope and allow you to change the field of view, working distance, and magnification. A barlow lens typically screws into the objective lens at the bottom of the microscope head. Using this formula, we can see that with a 0.5x barlow lens on our Amscope that has a working distance of 4”, we will get a new working distance of 8”. This is a little excessive for our tastes however, and we like to stick to a 0.75x barlow lens ($49; amazon.com) to get a nice middle ground of around 6”. Keep in mind too that as your working distance increases, the amount of light required in order to see the workpiece also increases, so larger working distances will require a brighter and more powerful light. The 0.75x barlow lens ($49; amazon.com) for the Amscope. There are many different types of light sources available for your microscope as well. The most popular ones include LED, halogen/fiber optic, and fluorescent. These also come in the form of ring lights and articulating lights. We have found that using ring lights of either the LED or halogen variety work best. Ring lights attach to the bottom of your microscope head and provide ample even lighting around the workpiece. Articulating lights tend to be uneven and require constant adjustment. A 144-LED light ring ($24; amazon.com). Halogen lights are generally brighter and more powerful than commercially available LED lights, although we have seen some DIY LED lights that are equally as bright. The color of the halogen lights also tends to have more of a yellowish tint to it as opposed to the bright blue of LED lights. This yellowish color provides better contrast when working under the microscope and makes it easier to see especially during long periods under the microscope. However, halogen lights use a lot of electricity and therefore generate a lot of heat – think about having to sit next to a 150w space heater all year long. 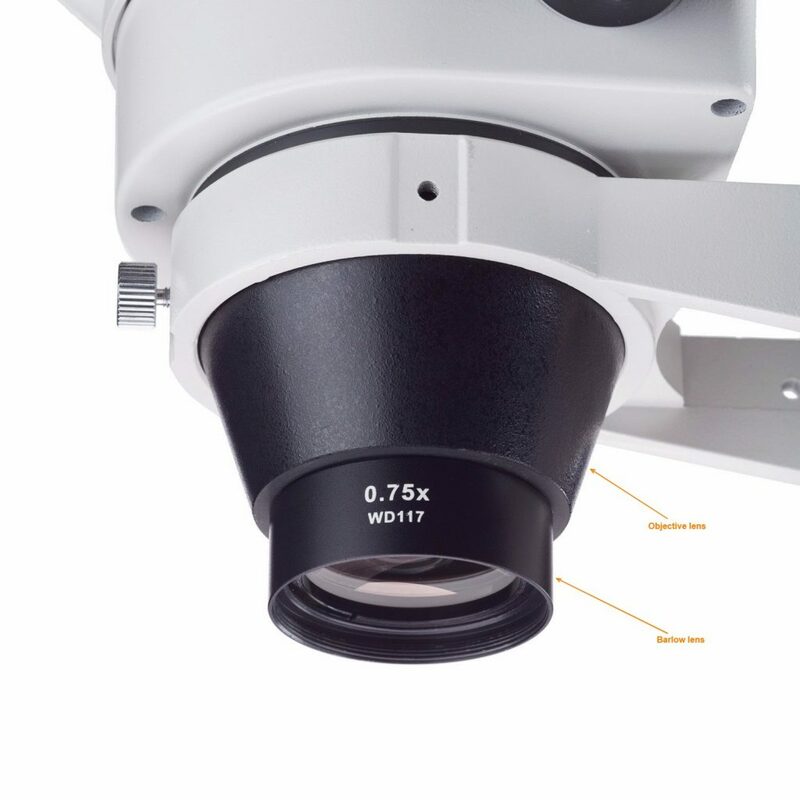 They also require thick fiber optic cables to connect the ring light to the base station that houses the actual light bulb, limiting the microscope’s range of movement. A halogen fiber optic ring light — note the large base and thick fiber optic cable. The biggest disadvantage of halogen lights though is that the bulbs do not last nearly as long as LEDs do and also were hard to find. We found that we were blowing a bulb every 3-4 months, and they are not something available at Home Depot. At $30/each and requiring us to keep a few in stock in case one blew, we found that although halogen lights made it easier and clearer when examining motherboards, the reliability, flexibility, and low operating cost of LED lights prevailed in the end. If you would like to add a camera to your microscope, look for a microscope head that is simul-focal such as this Amscope SM-4NTP ($458; amazon.com). A camera is a great way to teach other technicians and assist one another in component level logic board repair, as well as showing customers exactly what sort of repairs need to be made to their device. The trinocular port on the microscope allows the camera to take up its own dedicated spot without losing an eyepiece, while the simul-focal prism allows the user to see through both eyepieces at once while the camera is attached. Be careful of microscopes without simul-focal as it will disable one of the eyepieces when using the trinocular part, completely defeating the purpose of the trinocular port. A camera attaches to the trinocular port via a c-mount adapter ($35; amazon.com) like so. Many different cameras are available, however we recommend using ones with HDMI out instead of USB out. USB out tends to be very laggy and requires special drivers and software support, while HDMI is an industry standard and can work with TVs, monitors, capture cards, and lots more. 720p will be adequate, while 1080p will of course be better. There are also lots of options that include either 30 FPS or 60 FPS. We have found that this 720p 30 FPS camera ($139; amazon.com) provides a great picture at a great cost to value ratio. It also allows for direct HDMI output, so you can connect it straight to a TV or monitor. Keep in mind though that most cameras will require a specific c-mount adapter to mount it to the microscope’s trinocular port. This c-mount adapter ($35; amazon.com) is the one we found works with the Amscope SM-4NTP microscope. 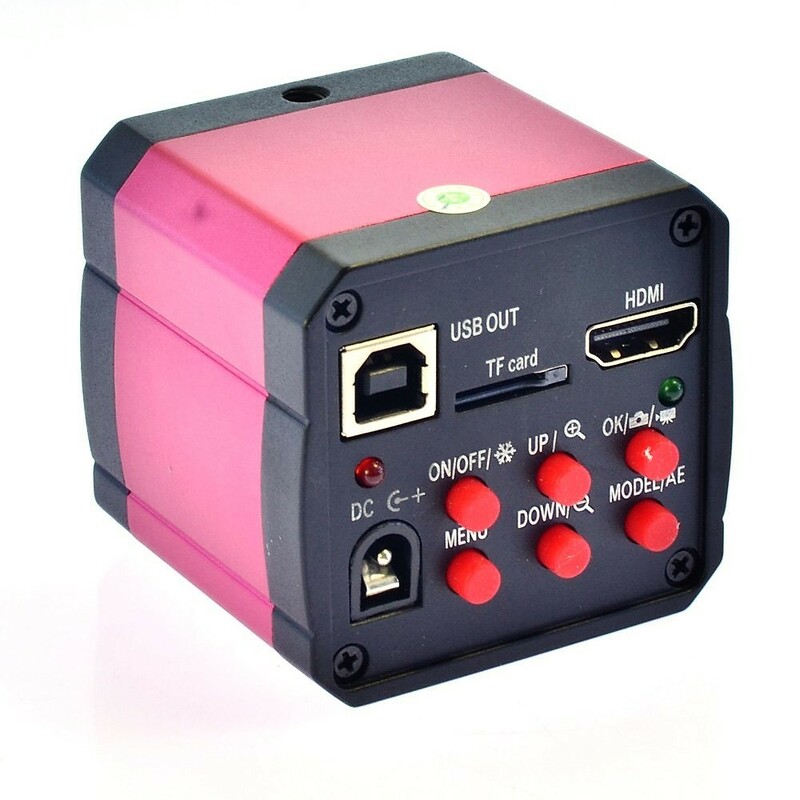 Our preferred affordable microscope camera ($139; amazon.com) with HDMI output. We shoot the majority of our product photos with this camera. The most important part of the microscope though is the actual glass within the microscope. The quality of the optics varies greatly between each model and brand. For the price, Amscope have got a completely acceptable and functional set of optics, however, for the sharpest and clearest view we have found that Nikon lenses are unbeatable. The clarity and sharpness provide an unrivaled depth of view that is almost 3D, and we found that it allowed for more objects with different heights to appear in focus at once. 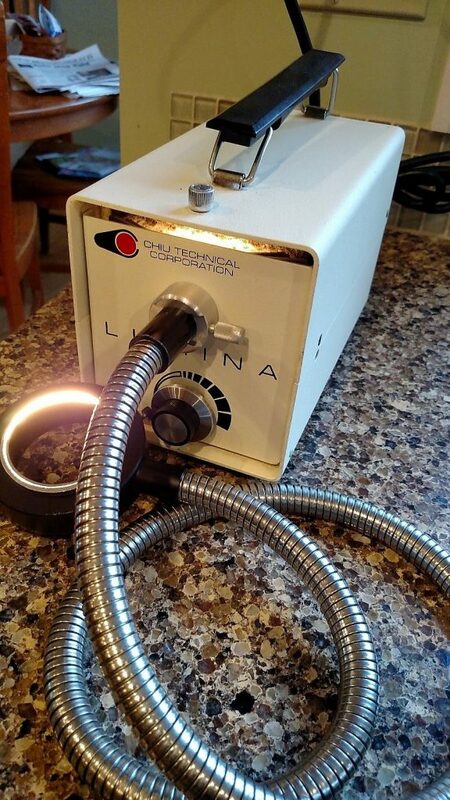 If you have the time, we recommend scouring eBay and surplus sites for used lab equipment which will usually have significantly better optics. A 100% crop of the same board shot through an Amscope SM-4NTP (left) and a Nikon SMZ-U (right). Notice how much sharper and clearer the Nikon optics are, especially on the edges of the traces. 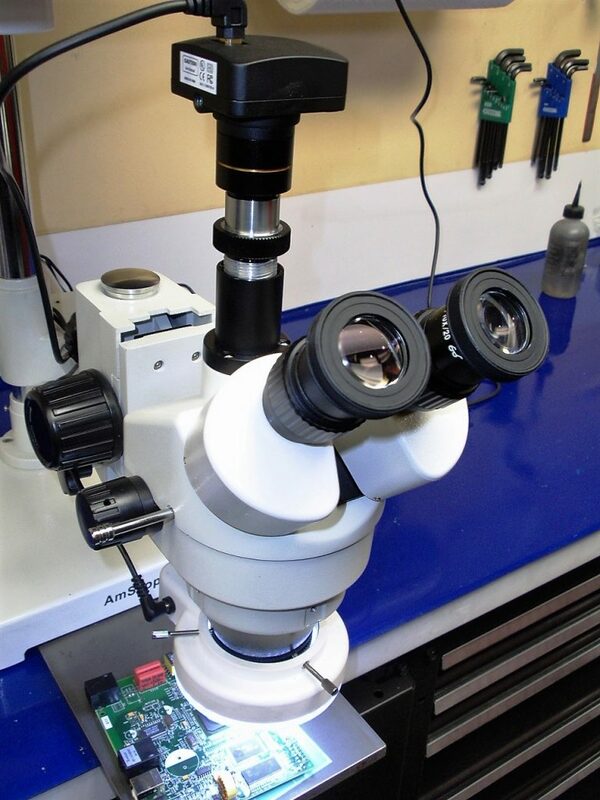 Hopefully you now understand everything you will ever need to know about microscopes for micro soldering. If you have any questions or feedback we would leave to hear from you below in the comments! The #1 stateside iPhone and iPad logic board parts supplier! Good write up. I would disagree with the articulating arm being impossible to use. As they do vibrate, we use them at all 4 stores, and vibrations transmitted though them are minimal, even with the hot air station stored on the base. Thanks so much for this guide. With this information, I was able to pick out the right microscope & camera setup for me! Helpful guide, but I disagree about the double boom stand. For anyone who does this day-in-day-out, I’d agree, but those folks wouldn’t need this guide anyway. 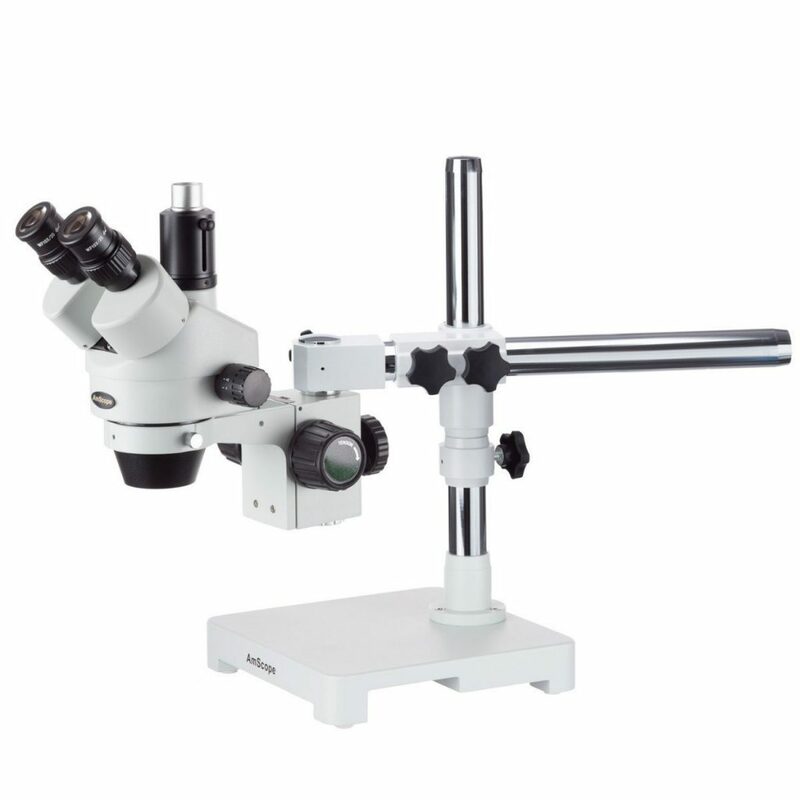 For a general-purpose microscope, the normal microscope stand from AmScope is the right thing. The key advantages are that the microscope is portable (you can reasonably carry it), and you have lighting available from underneath. As a general-purpose microscope, that’s much more helpful. It works reasonably for most soldering work too. With the Amscope, you can also rotate the head if you don’t want the scope over the stand. In practice, the scope is far enough away from the support that it’s fine for all microsoldering and inspection work I’ve done. Sometimes, for a superlarge board, I might need to rotate it to see one corner, but that’s not a big deal; it’s maybe once or twice a year. I’m with Peter re: the double-boom. YouTube user @electronupdate went over his setup here, covering everything from solder rework of SMT 0402s to taking pictures of actual silicon dies. For general purpose hobbyists, I think he goes over the whole gamut fairly well. Hackaday tried to approach this topic, and while the article itself wasn’t extraordinarily good, the discussion was pretty great for covering the pros/cons of each subset of work and what tools work best for that subset (reworking through-hole cold solder joints is going to require an entirely different setup than someone who is inspecting IC masks). RE board rework: If you’re going to be looking through a microscope all day doing, you probably already have a Mantis. But if you don’t- get one and your eye fatigue will disappear.